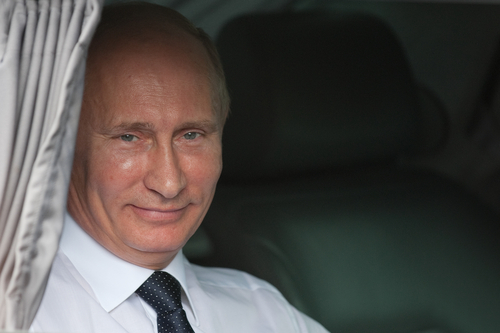 Putin on FIFA Arrests: A Nefarious Plot to Embarrass Russia! Sports makes people do nutty things, especially if they happen to be national governments. For example, Vladimir Putin’s Russia spent $50 billion—at least $50 billion that is countable—in putting on the Sochi winter Olympics, which was a full 25 percent more expensive than the much larger Beijing summer Olympics that had been the previous top-spending Olympic event. Fifty billion dollars was maybe 2.5 percent of Russia’s GDP at the time. The benefits of that kind of public spending are dubious to say the least, and some people might think that Russia’s current economic spiral may be related to the nation having sucked up that much money to put on a winter Olympics in a Russian summer resort on the Black Sea. But Putin considered Sochi an important mark of international recognition for Russia. The nations that benefit from landing host country roles for big events like the Olympics and the World Cup tend to be a bit defensive if someone criticizes the probity of the process. That’s the case now in the U.S. Department of Justice arrests of several top officials of FIFA, the international soccer body, that awarded the 2018 World Cup to Russia and the 2022 World Cup to Qatar. Taking umbrage that Russia’s hosting of the Cup is one of the flashpoints for the investigation of FIFA corruption, Russian president Vladimir Putin said he found it odd that the U.S. took action against people who weren’t U.S. citizens for actions that were not taken in the U.S., ignoring the fact that among the 14 people indicted were FIFA vice president Eugenio Figueredo, who apparently holds dual U.S. and Uruguayan citizenship, and Aaron Davidson, the president of Traffic Sports USA and the owner of an American Soccer League franchise in Cary, North Carolina. In addition, some portion of the alleged $150 million in bribes and favors went to and through U.S. banks. But Putin doesn’t think the U.S. has a reason to be involved in this way. He declared the arrests as an American attempt to prevent FIFA president Sepp Blatter from being re-elected (for a fifth term, which is scheduled to happen this week) and a “blatant violation of the principle of how international organizations function.” Putin went so far as to equate U.S. indictments of FIFA’s leadership with U.S. actions against Edward Snowden and Julian Assange. Kuwaiti sheikh Ahmad Al-Fahad Al-Sabah, who is about to join the FIFA executive committee (and heads the Association of National Olympic Committees), joined the Putin critique to hint darkly that the U.S. action might be related to something about Ukraine. Putin may be defensive about Russia’s hosting of the 2018 World Cup (a decision that FIFA has already said will not be re-voted), but the language that the Russian president is using about U.S. interference outside of its borders with international organizations suggests that he’s not thinking just about soccer. Readers will recall that Russia has enacted a Foreign Agent Law that has limited the activities of foreign-funded NGOs, based on Russia’s belief that “many NGOs act with a foreign agenda or in the interests of a foreign government.” Part of the Russian law may be geared toward resisting foreign interference in NGOs. Resisting U.S. intervention in FIFA’s operations fits the Russian approach, suggesting that the U.S., as a funder of some NGOs in Russia and NGOs like FIFA, doesn’t have the authority to undertake regulatory acts outside its borders concerning foreign nationals. The newest law in Russia is the Undesirable NGOs Bill that Putin recently signed. The new law allows for “the banning of NGOs working against the constitutional order and security of the country, and for punishing the individuals involved with fines and jail terms of up to six years.” Authorities in the U.S. and the European Union are protesting the Russian action, but Putin is getting some support, including in The Nation from freelancer Jalees Hazir, for pushing back against the forces of the imperial West, including the western-funded NGOs seen as instruments of the West aiming to hold Russia back.